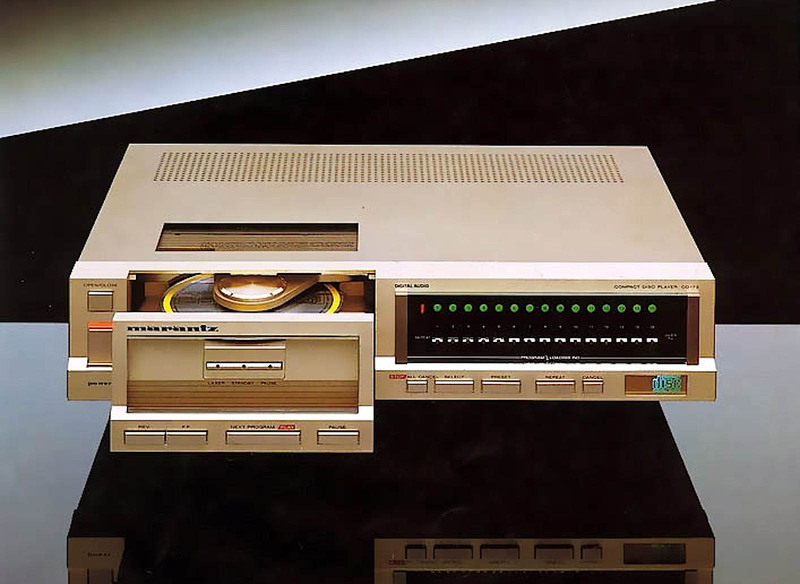 The top model in the company’s first generation range of CD players, it shared much of its genetic make-up with a Philips machine – the CD303. To wit, its line up of component parts reads like a wish list from any eighties digiphile. The jewel in the crown is its CDM-1 Pro mechanism complete with glass crystal lens. Mounted in a massive, sliding tray assembly (as per late eighties Meridians), when you press the open/close button the entire transport assembly slides out! Downstream of arguably the best CD transport ever designed lies something that’s still controversial today – Philips’ TDA 1540 14bit, 4x oversampling chipset and digital filter. That’s right, ten whole bits less than a £50 DVD player! The result is not as bad as you’d expect though – quite the reverse in fact. The fascia panel – in Marantz’s trademark champagne gold – is a riot. In fact, it’s so silly that you soon realise how tediously dull any modern player is. The display consists of fifteen green LEDs set behind a chunky Perspex strip, under which another fifteen are mounted. The green ones light up to show you which tracks are due to be played, while a single red one underneath shines to tell you the number of the track playing. Bonkers! Couldn’t they afford a numeric LED display? Upon reflection, considering that it would have been designed in 1981, the answer was probably no! Continuing the theme, the ’73 gets a range of additional LEDs. Inside the disc transport recess – which is thoughtfully exposed by a top-mounted Perspex inspection hatch(!) – you find a bank of three green LEDs either side to cast light on the disc you’re spinning. Was that homage to the world’s most advanced turntable, the Technics’ SL10 of five years back, one wonders? In the frontal disc transport window are three more – one for ‘Laser’, another for ‘Standby’ and another for ‘Pause’ – just to let you know what’s going on in the new digital age. And then there’s the power LED, and finally the bright blue backlit ‘Compact Disc Digital Audio’ logo. It’s great fun, but to portray the CD-73 simply as the digital equivalent of the Blackpool illuminations would be to miss the point. Once you’ve worked out how to use the counter-intuitive transport controls (play/next), cancel (stop), track scan and f.f/rewind (can one actually ‘rewind’ a disc? ), inserted a CD (and watched the transport thunk so fast back into the main case that the whole shebang jumps an inch backwards! ), it’s time to listen. The CD-73 sounds warm and involving. It’s an old cliché that the first generation Philips-based machines sound closer to analogue than anything digital subsequently produced – but it’s true. You get a soft and beguiling sound that really suits gentle, acoustic music beautifully – in fact, it flatters it. This machine is rich and sweet in the sense that nineteen seventies Linn LP12s were – it pulls you in an envelopes you rather than trying to assault your senses with the nth degree of detail resolution and dynamics. Happier with the strains of Glen Campbell’s Wichita Lineman than Goldie’s Timeless, it makes the best of certain types of music and renders others dull and undynamic. Marantz’s CD-73 is a paradox. It has one of the smoothest, most comforting sonic footprints, yet is an immensely charismatic machine. Unlike so, so many modern digital disc spinners, you really know where you are with this bit of kit and have to learn to love it – you can’t just expect it to accommodate you. These days, it’s getting rare. After all, it originally cost over £500 in 1983 (about a third more than a Linn LP12 at the time), so would never have exactly been a volume seller. Still, you can find them for £250 or less if you look. You must try before you buy however, ensuring that you check the transport tracks the disc properly. A good example should play anything – including modern 80 minute CD-Rs!